After showcasing the first five entries to the Nor-Shipping Next Generation Ship Award we present the second five which represent very different types of ships. This year will see another vessel chosen by the Next Generation Ship Award Jury as the winner of the prestigious prize presented by the organisers of Nor-Shipping. Entry to the award is open to all vessels that have either been delivered or which have undergone major conversion since the 2017 Nor-Shipping Exhibition, or that are scheduled for delivery within three years of the 2019 event. Nor-Shipping’s expert jury will look to identify the project demonstrating the greatest advances and innovation in design, assessed with respect to energy efficiency, innovation, suitability and flexibility, technology utilisation, safety and security and environmental sustainability. All ship types will be given equal consideration, regardless of size or segment. The jury will soon begin drawing up its shortlist and will be meeting in April to decide the eventual winner. Ships are long term assets and in a fast moving world of technological innovation keeping ahead of the pack means either integrating the advances in newbuildings or giving existing ships a new edge by retrofit or conversion.  ShipInsight and Nor-Shipping are showcasing all of the entries for this year’s award in a series of articles. They are presented in the order of entry date and thus nothing about their chances of success in the awards should be inferred. 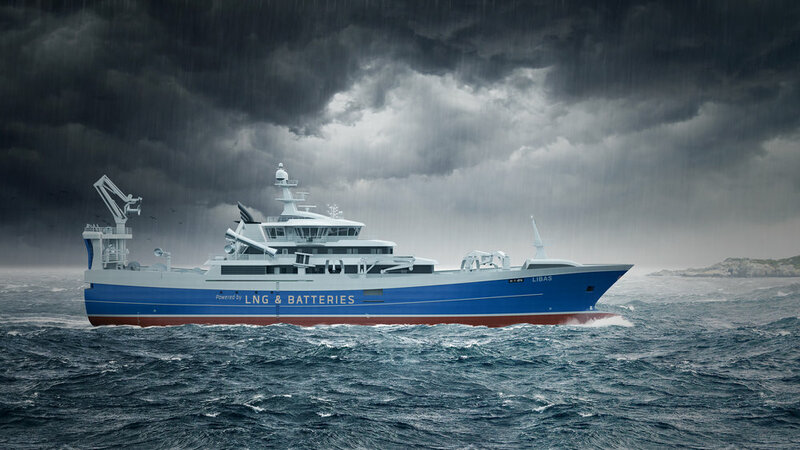 Proving that innovation is not limited to commercial, passenger and offshore vessels, Libas has already staked a claim to fame as the world’s first LNG and battery-driven hybrid purse seiner trawler. Designed by SALT Ship Design and being built at Cemre Shipyard in Turkey and powered by an MAN 6L51/60DF engine combined with 500kWh Corvus battery, Libas is 86ms long and has a beam of 17.8m. The ship is equipped as a purse seiner, both single and double trawling and has an additional energy saving technologies. One of them is energy saving from electric winches, the surplus energy of the winches will be used as power onboard or to charge the battery. The other technology is power generation from the roll reduction tank. When the ship rolls, water moves into the vortex chamber and then the opposite side vortex chamber, that flow goes into turbines and generates power. The combination of energy saving measures means a 15% saving in fuel consumption and, with the engines running on LNG, an 80% NOx reduction and a cut of 24% in CO2 emissions. 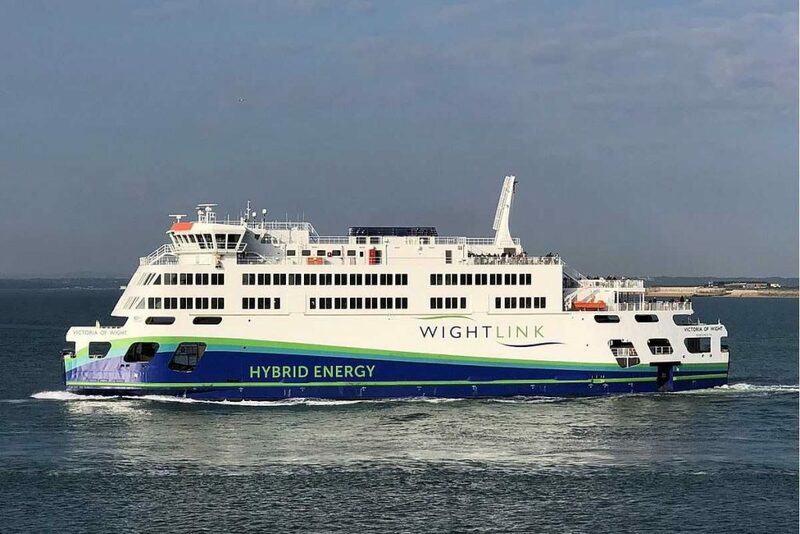 Demonstrating that new ferry technologies are not limited to Norway, the 2018-built Victoria of Wight is England’s first hybrid energy ferry and links the Isle of Wight with the UK mainland, sailing round-the-clock carrying freight, holidaymakers and local people across the Solent 364 days a year. Owners Wightlink chose a Wärtsilä integrated Low Loss system with batteries. While it is technologically advanced it also had a proven pedigree of in-service reliability. The vessel has utilised the latest design of Voith propellers with the most efficient propeller blade design. The use of energy has been carefully considered and maximum efficient use of the generators has been arranged to ensure they operate at optimum efficiency simultaneously providing power for propulsion and charging the batteries. A two-tier loading arrangement has increased loading time efficiency ensuring that the vessel can sail to a timetable that does not require using additional speed, and fuel, to “catch up”. The efficiency of loading is assisted by the Cavotec MoorMaster mooring system which provides a faster system to secure the vessel. 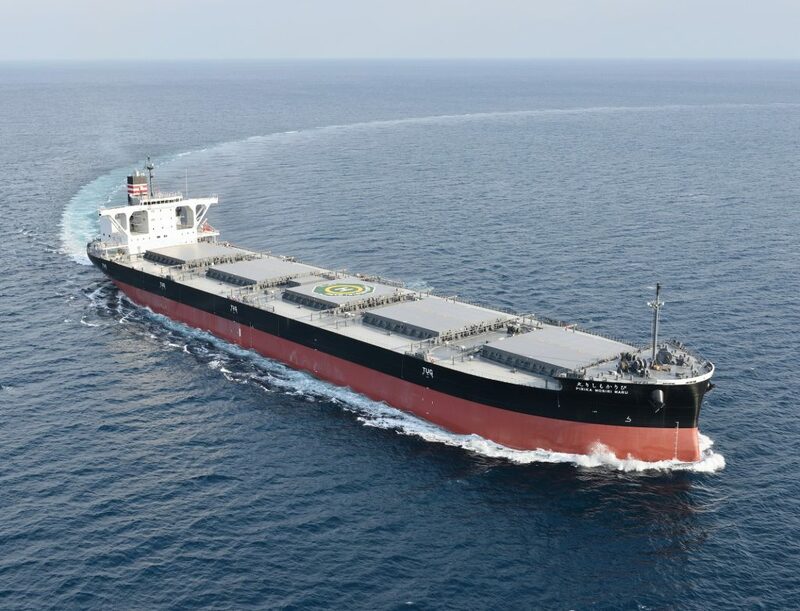 Delivered in January this year to NYK Line by Oshima Shipbuilding in Japan, Pirika Mosiri Maru is an 89,372dwt New Panamax coal carrier. The vessel is equipped with a binary cycle power generation system, an innovative system that utilises exhaust heat from engine exhaust. The generated electric power will serve as auxiliary power and will reduce CO2 emissions by up to about 2 percent by decreasing fuel consumption. In the theoretical calculation, the binary cycle power generation system improves IMO EEDI reduction percentage by at least 1 point for this vessel. The binary cycle power generation system uses the heat emitted from the ship’s engine, which has largely gone unutilised in previous vessels of similar size, as the heat source to generate approximately 100 kW. In addition, the lower temperature supplied back to the engine through the turbocharger improves the engine efficiency, which results in lower CO2 emissions. The main engines of the ship in actual operation undergo large load fluctuations. The binary cycle power generation system can generate electricity under a wide range of conditions, from high loads (about 70-90%) to low loads (about 50%). 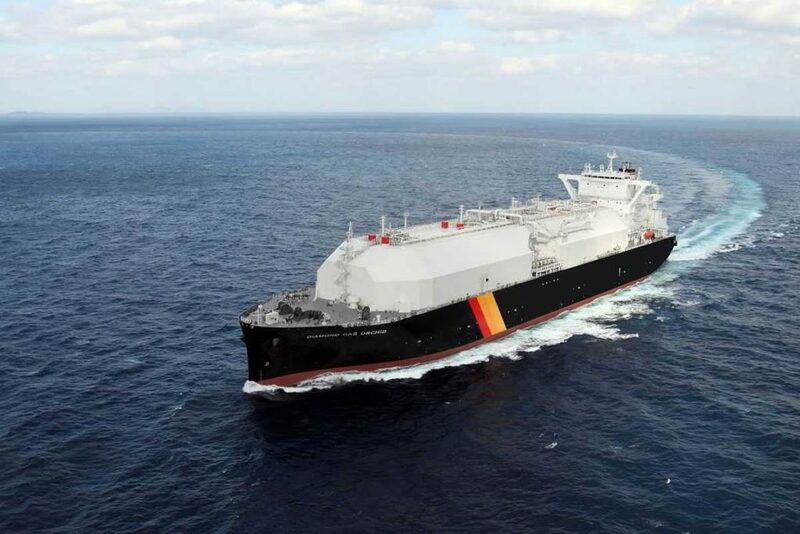 A new design of LNG carrier developed by Mitsubishi Shipbuilding and delivered to NYK Line in 2018, Diamond Gas Orchid is the first of the Sayaringo STaGE type. It has a continuous cover over the cargo tanks, a feature inherited from its predecessor the “Sayaendo. STaGE is an abbreviation for Steam Turbine and Gas Engine and is a hybrid propulsion plant that consists of an ultra-steam turbine plant on the port side and a combination of a dual-fuel diesel engine and an electric propulsion motor DFE-PEM plant, on the starboard side. The exhaust-gas and jacket waste heat from the DFE are recovered to heat the feedwater going toward the UST plant. In the UST plant, the heated feedwater flows to the boiler to generate steam for driving the turbine. The electricity generated by the DFEs drives the PEM. Ordinarily, a huge amount of waste heat from DFEs is dumped into the exhaust-gas and jacket cooling water but the STaGE plant uses the waste heat to heat the boiler feedwater, enhancing the plant’s total efficiency. The waste heat from the DFEs is also recycled to generate auxiliary steam as well as the drive steam for the main turbine, also enhancing total efficiency. 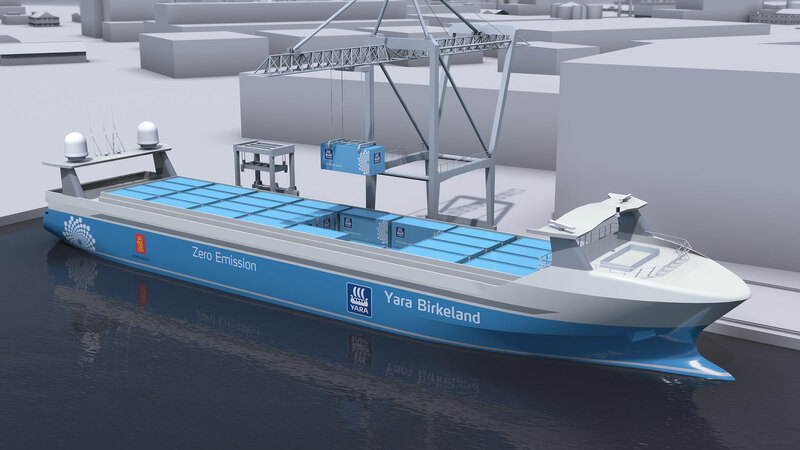 Possibly one of the most heralded new ships, Yara Birkeland will be the world’s first fully electric, zero emissions and autonomous container ship. The move to all electric operations also extends onto land. Loading and unloading will be done automatically using electric cranes and equipment. The ship will also be equipped with an automatic mooring system. Powered by hydro-electric and a battery energy storage system, Yara Birkeland and the port infrastructure will produce no harmful greenhouse gasses for the entire operational lifecycle. Under-construction by Norwegian shipbuilder Vard, Yara Birkeland will be one of the first Maritime Autonomous Surface Ships (MASS) to enter commercial operations. The move to unmanned operations will be phased, giving Yara International and Kongsberg time to test the advanced systems that enable operation without a human at the helm. When delivered from the Yard early in 2020, Yara Birkeland will be a manned vessel. Autonomous functions will gradually be implemented, tested and validated, with the target of performing fully autonomous unmanned operations by 2022. In total, three centres with different operational profiles are planned to handle all aspects of operation including emergency and exception handling, condition monitoring, operational monitoring, decision support, surveillance of the ship and its surroundings and all other aspects of safety. We are showcasing all of the entries for this year’s award in a series of articles. They are presented in the order of entry date and thus nothing about their chances of success in the awards should be inferred.